I’ve attended and officiated at some quirky Seders, but this one takes the cake, er, matzoh. We’re going to the home of my first husband, where his current wife will preside and the guests will include my Irish Catholic second and current husband, my Filipino Catholic daughter-in-law, and my adorable granddaughters, of whom the older will be making her First Communion in a couple of months. Genetically, the girls are half Jewish, 7/16 Filipino, and 1/16 Chinese. (The Chinese, as we learned when we went to Manila for the wedding ten years ago, occupy much the same sociological position in the Phillippines as the Jews have in many European cultures over the centuries: outsiders who become prosperous merchants and tend to get resented by the dominant culture when times are tough.) Anyhow, Passover and Chanukah every year are all the grandchildren are going to get of their Jewish heritage, so all the grownups are invested in making these holidays as memorable as possible. Having grandchildren who aren’t being raised in the Jewish tradition has made me have to think about what exactly being Jewish means to me—not for the first time, but perhaps from a fresh perspective and with a little more of the perceptiveness I hope I’ve acquired with age. My family were secular Jews, who hardly followed any of the tradition except observing the major holidays, though their sense of the Jews as a people was strong and they wanted to pass that sense of peoplehood along to their children. When I was a kid, there were no alternatives to the traditional Haggadah, the book that contains the ritual of the Passover Seder—no feminist Haggadah with an orange on the Seder plate, no egalitarian Haggadah with a special prayer for vegetarians. We went through the whole Haggadah in Hebrew, which my father and his brothers and sisters had learned by rote as children back at the beginning of the 20th century. (My father must have had his bar mitzvah in 1912.) In those days, no attempt was made to help the children understand what they were reading. They didn’t skip anything, we didn’t understand anything, they didn’t let us have carrot sticks or a piece of matzoh before the part where the Haggadah says you can eat the meal, and by the time that point came, we were starving. But as I’ve tried to find ways to explain the story of Moses and the Exodus of the Jews from Egypt after four hundred years of slavery so my granddaughters will understand, I’ve found much to be proud of in what the Jewish people chose to make of that experience and repeat to their children and their children’s children down through the centuries. On Passover, we remind each other that we have been oppressed in every age. If you look at history, it’s true: the expulsion from Spain and persecution by the Inquisition in 1492, a period I’ve written about in my fiction; the Holocaust.... They tried to destroy us, and we survived. But that’s not the point. If you pay attention to what the Haggadah actually says, we tell our children that we cannot be completely content while one person in the world suffers—not one Jew, but one person—even our worst enemy. God visited a series of plagues on the Egyptians, the story goes, until Pharaoh finally let our people go. When Pharaoh broke his promise and pursued the Jews, we’re told the Red Sea parted and the Egyptian soldiers were drowned. Yet we are admonished not to gloat over the downfall of our enemies, but to empathize. What a beautiful explanation of your family tradition. Thank you, and mazel tov! Hag sameah, Liz. great stories. did you grow up on Maxwell House haggadot? 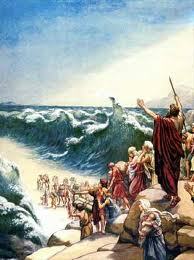 we had our seder last bight and i got to sing my song Nachshon, about the parting of the Red Sea. I enjoyed the article, Liz. It sounds as if you have a wonderful family--perhaps the greatest of blessings! With a Jewish aunt and uncles, my brothers and I were taught the traditions. We shared holidays with one another and, as I mentioned on Criminal Brief, or Christmas tree was topped with a Star of David. My mother (who'd learned all the really boring Yiddish, like words for tea an vegetables), brought matzo in for communion and dreidels in for church school during Christmas. It would probably flip today's fundamentalists of all stripes out, but it made sense to us and it worked. I have a sentimental spot for Purim. In school, an extremely shy girl used the holiday to give me a bag of treats (mishloach manot) signalling that she liked me. I'm still touched by that tender approach. Leigh, I get it completely. When Xmas falls on Chanukah, I put red and green candles in the menorah. I love having an ecumenical family. Just got back from the Seder, and I learned a new and brilliant trick I'd never heard of before: telling the children they have to close their eyes while the Afikomen is hidden! Great post, Liz. One which has me reflecting on times I joined my best childhood friend and his family for seder, in high school and college—even though I’m not Jewish. These days he’s a judge, down in Tucson, but he stopped by for a visit about a week ago. He got a kick out of it, when I told him how the kids and I had done a “re-enactment of the first Passover” in the Sunday School class I taught that morning.